This is a medieval English surname. It derives from either residence by a river called the Humber, or from one of the several such places, specifically Humber village in Devon. In Ancient British times the word 'humber' meant a river or stream, and at one time as a many as half the rivers of the country were called 'humbers'. 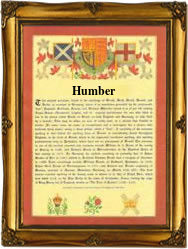 Today there are perhaps five of which the Yorkshire Humber is the only one which has any national importance. Locational and residential surnames were often given to people after they left their origin homestead and settled elsewhere, and this seems to be the situation with 'Humber' nameholders. The first church recordings that we have been able to discover are from London. The early Devonian recordings have the additive suffix 't', a local dialectal used to aid pronunciation. It is claimed that some Humber nameholders are short forms of the locational name 'Humberstone', and this is possible, Humberstone being a much more widely recorded surname. Early examples of the surname recording taken from registers across the country include Allice Humber, christened at the church of St Mary Magdalene, Bermondsey, on February 11th 1601, Hugh Humberte of Upottery, Devon, on August 28th 1607, Christopher Humber of Totnes, Devon, on December 9th 1621, and Richard Humber, christened at St Peters church, Leeds, Yorkshire on March 1st 1657. The first recorded spelling of the family name is shown to be that of Martyne Humber, which was dated February 5th 1586, married at St Katherines by the Tower (of London), during the reign of Queen Elizabeth 1st, known as 'Good Queen Bess', 1558 - 1603. Surnames became necessary when governments introduced personal taxation. In England this was known as Poll Tax. Throughout the centuries, surnames in every country have continued to "develop" often leading to astonishing variants of the original spelling.